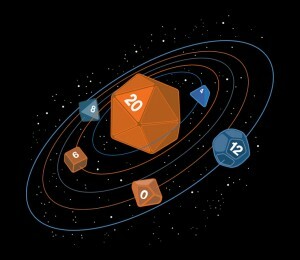 Sometimes it seems like your life is guided by a random roll of polyhedronic dice. Is polyhedronic a word? It is now. Take the magical powers, fantaistical setting, and mythical creatures away from your D&D campaign and it’s not too much different from your everyday life. Everything is random, if slightly directed. But, then, I guess that’s why you add the magical powers, fantastical setting and mythical creatures. Who wants to play a game that’s just like everyday life? Do D&D characters play D&T? Death and Taxes? Okay, none of that actually matters. What I just realized is that the sun in the solar system depicted on this T-shirt is going critical. Wrap this cloth around your torso before the sun explodes!